Home/Reformation/The Great Controversy/What is the Sanctuary? After the settlement of the Hebrews in Canaan, the tabernacle was replaced by the temple of Solomon, which, though a permanent structure and upon a larger scale, observed the same proportions, and was similarly furnished. In this form the sanctuary existed—except while it lay in ruins in Daniel’s time—until its destruction by the Romans, in A.D. 70. “He shall bear the glory.” To Christ belongs the glory of redemption for the fallen race. Through the eternal ages, the song of the ransomed ones will be: “Unto Him that loved us, and washed us from our sins in His own blood, . . . to Him be glory and dominion for ever and ever.” Revelation 1:5, 6. The cleansing, both in the typical and in the real service, must be accomplished with blood: in the former, with the blood of animals; in the latter, with the blood of Christ. Paul states, as the reason why this cleansing must be performed with blood, that without shedding of blood is no remission . Remission, or putting away of sin, is the work to be accomplished. But how could there be sin connected with the sanctuary, either in heaven or upon the earth? This may be learned by reference to the symbolic service; for the priests who officiated on earth, served “unto the example and shadow of heavenly things.” Hebrews 8:5. Such was the work that went on, day by day, throughout the year. The sins of Israel were thus transferred to the sanctuary, and a special work became necessary for their removal. God commanded that an atonement be made for each of the sacred apartments. 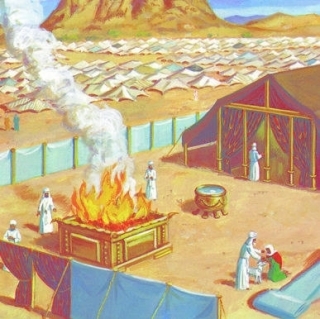 “He shall make an atonement for the holy place, because of the uncleanness of the children of Israel, and because of their transgressions in all their sins: and so shall he do for the tabernacle of the congregation, that remaineth among them in the midst of their uncleanness.” An atonement was also to be made for the altar, to “cleanse it, and hallow if from the uncleanness of the children of Israel.” Leviticus 16:16, 19.